Have you ever wondered how many sunscreens have insanely high SPF ratings, but don’t actually contain the necessary amounts of the various UV filters to achieve such a rating? Well, I definitely have. And more often then not, the questionable SPF ratings occur with sunscreens that utilize inorganic UV filters such as titanium dioxide (TiO2) and zinc oxide (ZnO). While I’ve certainly seen similar organic sunscreens, the disparity between the high SPF ratings and the relatively low % of UV filters is usually less with those types of sunscreens. Therefore, this post will focus primarily on inorganic sunscreens; though as you will soon see, this issue readily applies to organic ones as well. Now, I’ve always attributed this unexplained phenomenon to the manufacturer’s ability to manipulate the vehicle, coating type, particle size, etc… to achieve such a high SPF rating. For more information on what factors can influence an inorganic UV filter’s capacity to protect against the sun, see Part III of the Sunscreen Battle. While I certainly still acknowledge that these aspects will influence a particular sunscreen’s SPF rating, there’s something that I have never considered: That a formulation’s antioxidants and anti-inflammatories can skew, exaggerate, and even mask a product’s TRUE SPF rating. But before we get into that, we need to first understand WHAT SPF really means, and HOW it is measured. What Does SPF Mean? How Is It Measured? I know this is an bell curve for IQ scores, but it fits surprisingly well for the sun’s UVB output over time. 55 = sunrise (~6:00 AM), 85 = 10:00 AM, 115 = 2:00 PM, and 145 = sunset (~6:00 PM). This is why most medical organizations recommend minimizing sun exposure from 10:00 AM-2:00 PM–when the sun is at its strongest. Furthermore, the UV Transmission will change due to a variety of factors such as sunscreen transfer, absorption, and degradation. This is why I recommend inorganic sunscreens because they are inherently stable and do not absorb into the skin at all. And of course, application amount will definitely vary–another influence on a product’s true SPF rating. Therefore, there’s really no point in drawing much literal meaning from that limited definition of SPF. Another often used definition of SPF is to say that an SPF of 15 will block [1- (1/15)] x 100% = 93.33% of UVB rays, because it’s extending the MED by 15, meaning that the same small amount of UVB light gets through the sunscreen per single MED, until the skin finally burns after 15 of those (100-93.33%) = 6.67% MEDs. Like the other example, this is theoretically true. Unlike the other example however, this is also realistically true (to an extent), though many people don’t realize it. The fault lies with its interpretation and presentation. Depicted as such, most people focus on the % of UVB light blocked. Therefore, an SPF of 10 blocks 90% of UVB rays, and an SPF of 50 blocks 98%–a difference of only 8%. In reality however, the difference is much more significant that it appears on paper. Your skin has a natural protective and corrective enzymatic system that will repair UVB-induced damage. However, it can only do this at a certain rate. Furthermore, it can be overwhelmed by a sudden influx of UVB-induced damage, which results in erythema or a sunburn. Think of it like trying to pump water out of a boat that has a small hole in the floor, versus trying to do so in the middle of a hurricane. Therefore, what’s important to note is how much UVB light is actually coming into contact with the skin at any one time. The lower the amount of direct DNA damage is present (at any one time), the more effect your skin’s reparative enzymes will have on the cumulative amount of damage. It is likely that the arbitrary SPF rating of 15 was shown to be the approximate threshold at which the skin can repair itself without too much trouble. Therefore, it is the % of UVB light that sunscreens DON’T block or ALLOW TO HIT THE SKIN AT ANY ONE TIME, that is ultimately important. A: As demonstrated above, this definition alone is too specific because it only considers time. In order to better understand the meaning of SPF, you have to evaluate the definition by action/time or RATE–specifically, the rate at which a sunscreen allows UVB light to hit the skin. With this updated and more encompassing definition, you will indeed see that SPF 30 is TWICE as strong as SPF 15! SPF 30 allows 100/30 = ~3.33% of UVB light to hit the skin. SPF 15 allows 100/15 = ~6.66% of UVB light to hit the skin. ~3.33% X 2 = ~6.66%. SPF 15 allows TWICE the amount of UVB light to hit the skin compared to SPF 30. Keep in mind that “TWICE” is a relative measurement, rather than an absolute one. Let’s go back to how SPF is calculated. It takes into account the Sun Spectrum, the Erythemal Action Spectrum, and the UV Transmission. As shown above, in realistic scenarios both the 1st and 3rd aspects will change over time. The 2nd aspect (Erythemal Action Spectrum) remains the same. However, with the addition of antioxidants and anti-inflammatories, this 2nd aspect will now also change over time. Because SPF is based on how much energy it takes to trigger erythema or sunburn, antioxidants and anti-inflammatories that reduce erythema are thereby exaggerating how well the UV filters protect against UVB rays! But isn’t reducing erythema regardless of the mechanism a good thing? Well, yes and no. Yes, in the sense that reducing erythema/redness/sunburn is good. But no, in the sense that a high SPF rating (achieved by antioxidants, anti-flammatories, and UV filters) makes people think that they are very well protected from UVB light and that the UV filters (or the active ingredients) are responsible! In order to fully understand this subtle difference, we need to understand what happens when UVB light hits the skin. What Happens When UVB Light Hits the Skin? Direct DNA damage caused by UVB light. UVB light is very potent. But due to its potency, it is limited to the epidermis. Therefore, it directly damages DNA in living (epidermal) skin cells. 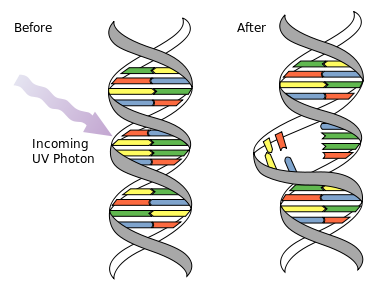 When this happens, the DNA strand will break away from its conjugate or corresponding pair, and attach to other bases. The resulting structures become either cyclobutane pyrimidine dimers (CPD), or pyrimidine 6 to 4 photoproducts. At this point, most of the DNA damage will be repaired by enzymatic excision. However, the few that are not will then be recognized by transcription factor NF-κB, which will then activate the synthesis of a variety of regulatory and inflammatory mediators such as cytokines and matrix metalloproteinases, which then of course trigger erythema and eventually apoptosis (programmed cell death). UV filters (whether inorganic or organic) directly stop UVB light from coming into contact with the skin. Therefore, no direct DNA damage occurs. Antioxidants like green tea on the other hand, allow UV light to come into contact with the skin, meaning that they do not act like direct UV filters. They just repair any DNA damage afterwards. Keep in mind that the success rate of repair is not 100%. Anti-inflammatories like aloe vera are the worst, in the sense that they will reduce the erythemal reaction, without actually repairing the DNA damage. So you walk into a bar (no, this is the not the beginning of a joke) and someone shoots you with a gun. ZnO would acts like body armor and stop the bullet from hitting your body. Therefore, you wouldn’t scream. Green tea would act like a doctor and allow the bullet to hit your body, but then repair the wound soon afterwards. Therefore, you wouldn’t scream. 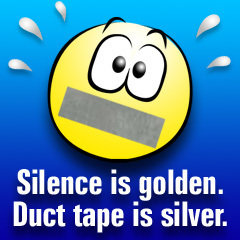 Aloe vera would act like duct tape and allow the bullet to hit your body, but then muffle your mouth soon afterwards. Therefore, your scream wouldn’t be heard. So SPF ratings are basically measured by counting the number of screams. As you can see, all three compounds (UV filters, antioxidants, and anti-inflammatories) result in no screams being heard. But the mechanisms by which they do so, are very different. But does that mean that antioxidants and anti-inflammatories are a bad thing? Well, obviously not. Antioxidants are meant to take care of the effects of any UVB (and UVA, but we’re just talking about UVB in this SPF-related post) light that manages to get past the UV filters; they’re the last line of defense. Anti-inflammatories are meant to reduce any redness, because let’s face it, no one likes that. And keep in mind that many anti-inflammatories are antioxidants as well. It’s just the compounds that are strictly anti-inflammatories that should be avoided after sun exposure if your goal is to repair DNA damage. But after a sunburn manifests (when the damage has already occurred and nothing can be done) anti-inflammatories will be your best friend because they reduce the inflammatory response, without significantly interfering with the healing process. But the point of all this is to show that you need to be careful and not be fooled by sunscreens that have high SPF ratings and a mismatched amount of UV filters. Because while you think that these sunscreens will provide a lot of protection, they won’t. But you can’t tell because the visible response to direct DNA damage (erythema) has been masked. 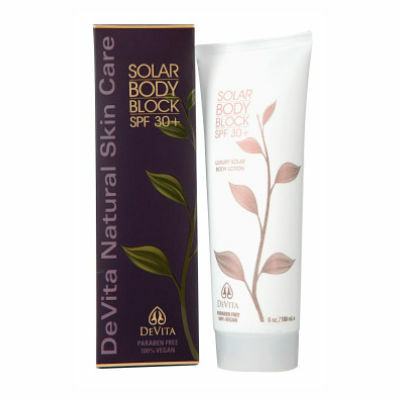 Devita SPF 30? Hm, I think not! ACTIVE INGREDIENT: Zinc oxide 19% INACTIVE INGREDIENTS: Aloe barbadensis (certified organic aloe vera gel), Water (purified), Camellia sinensis (Japanese green tea) leaf extract, Capric/caprylic triglycerides (derived from coconut oil), Glycerin (vegetable), Butyrospermum parkii (shea butter), Olea europaea (olive) oil, Lecithin phospholipid, Hyaluronic acid (vegan source), Simmondsia chinensis* (jojoba) seed oil, Squalane (olive), Panthenol (vitamin B5), Tocopherol (vitamin E), NaPCA, Rosa moschata (rose hips) oil, Centella asiatica (goto kola), Copper gluconate, Magnesium ascorbyl phosphate, Fucus vesiculosis (seaweed) extract, Allantoin, Sodium riboflavin phosphate, Chondrus crispus (Irish moss), Lavandula officinalis* (lavender) essential oil, Anthemis nobilis (chamomile) flower essential oil, Vitis vinifera* (grape) seed extract. Note that, Devita uses uncoated ZnO particles. Now, it was documented that even at the maximally allowed concentration (25%), it was difficult for ZnO to achieve an SPF greater than 10. Uncoated ZnO at 25% also yields the same number using the BASF sunscreen simulator, which IS THE BEST TOOL THAT THE AVERAGE CONSUMER CAN USE TO MEASURE THE EFFICACY OF A SUNSCREEN. Did that really require the use of CAPS? YES! But we’ll get into its pros and cons, and how to use and understand that tool in another post. That being said, how in the world did Devita achieve an SPF of 30 for this product? Again as I said above, while I agree that the vehicle, clumping tendencies, particle size, etc… can influence the SPF rating, I don’t believe they can influence it THAT much, at least not from SPF 10 to SPF 30, and not from this formulation! Looking at the vehicle, it’s not super sophisticated or complicated to understand. The ZnO particles (being uncoated) are suspended in the water phase AKA the aloe vera gel and water, along with several other water-soluble plant extracts such as green tea. The rest are suspended in the oil phase that is made up of the various non-fragrant plant oils and their related components such as triglycerides. Finally, to keep the two phases mixed, lecithin phospholipid acts as the primarily emulsifier. As you can see, there are no complicated cross/copolymers, acrylates, synthetic hybrids, or any of that crazy stuff with which to contend. But what IS present? A lot of green tea and aloe vera… *DUN DUN DUN* THAT’S how Devita achieved such a high SPF rating with just uncoated ZnO. How sneaky…! I’m not saying this is a bad sunscreen. But you may want think twice before bringing this to the beach. So Should I Still Look for Antioxidants and Anti-Inflammatories in Sunscreens? Well, the answer to that will vary depending on the individual and the product in question. For the “Ideal Routine,” I always recommend a separate antioxidant product that’s to be applied underneath the sunscreen, because as a dedicated product, it tends to contain significantly higher %s of antioxidants. As for the sunscreen, whether or not it contains antioxidants and anti-inflammatories should be irrelevant. If it contains some, great? If not, that’s great too. In order to find out if your sunscreen provides adequate protection from the UV filters alone, use the BASF sunscreen simulator to evaluate its efficacy in terms of SPF, UVA-PF, uniformity of sun protection, and stability. Again, I’ll get into how to use and interpret this simulator in another post. As long as the UV filters alone provide adequate levels of protection, then the antioxidants and anti-inflammatories are just icing and cherries. Similarly, for those of you who don’t have time or prefer to have combination products (sunscreen with antioxidants), use the BASF simulator to evaluate whether or not the UV filters alone provide adequate sun protection. The most important thing is to reduce the total amount of UVB light hitting your skin AT ANY ONE TIME. Therefore, see SPF ratings as the % of UVB light that are allowed in, rather than the % of UVB light blocked/absorbed. Always use the BASF sunscreen simulator to check and see if your sunscreen provides adequate sun protection based on the UV filters alone, because non-vehicular “beneficial” ingredients like antioxidants and anti-inflammatories, can seriously skew, exaggerate, and mask a sunscreen’s true SPF rating. ***Oh and note that antioxidants and anti-inflammatories cannot skew UVA-PF/PPD/PA ratings because they cannot meaningfully prevent the immediate oxidation or darkening of existing melanin in the skin–the characteristic from which these ratings are measured. Well, I hope this topic was as EYE-OPENING as it was for me. When I first made this connection between antioxidants and fluffed SPF ratings, I was like WHOA. MIND = BLOWN. EUREKA. Okay, the nerd is done. « Do the Top 5 Most Reviewed BB and CC Creams on Sephora Provide Adequate Sun Protection? 2) I was thinking about trying this sunscreen, but I can’t figure out where it gets its SPF rating from: http://www.pratimaskincare.com/neem-rose-face-sunscreen# it has 18.6% zinc, but no aloe, green tea, etc. so I’m not sure what’s going on. 3) Do any of these added antioxidants boost protection from UVA rays or do they only boost the SPF? 1) Yes, the “ideal” sunscreen provides equal protection against both UVA and UVB rays. However, zinc oxide pretty much does that, but unless used in very high concentrations, is not adequate in terms of providing enough protection against UVB rays. UVA rays are considered more dangerous because they are present in a much higher concentration in sunlight, and penetrate more deeply in the skin. But both types of UV rays can cause cancer, so the most important thing is to stay out of the sun and find a good sunscreen. 2) I wouldn’t recommend that sunscreen unfortunately. 3) They can also add protection to UVA, but because that isn’t as easily measured, I chose to not address the issue. But I did mention this in the article itself. The most important thing is to do your best to apply enough sunscreen and avoid unnecessary sun exposure. Other Ingredients: Water, Cyclopentasiloxane (silicone slip agent), PEG/PPG-18/18 Dimethicone (silicone-based thickener), Dimethicone Crosspolymer (silicone suspending agent), PEG-12 Dimethicone (silicone-based thickener), Resveratrol, Quercetin, Epigallocatechin Gallate (antioxidants), Tocopheryl Acetate (vitamin E/antioxidant), Tetrahexyldecyl Ascorbate (vitamin C/antioxidant), Adenosine (cell-communicating ingredient), Lauroyl Lysine (skin-conditioning agent), Bisabolol (anti-irritant), Trihydroxystearin (thickener), Salix Alba (Willow) Bark Extract (anti-irritant), Punica Granatum (Pomegranate) Extract (antioxidant), Haemstococcus Pluvialis Extract (astaxanthin/antioxidant), Hydrolyzed Corn Starch (thickener/mattifying agent), Polysorbate 80 (emulsifier), Hydrolyzed Silica (thickener/mattifying agent), Triethoxycaprylylsilane (silicone-based binding agent), C12-15 Alkyl Benzoate (emollient thickener), Isopropyl Titanium Triisostearate (texture enhancer), Caprylyl Glycol, Hexylene Glycol (preservatives), Sodium Chloride (stabilizer), Ethylhexylglycerin, Phenoxyethanol (preservatives), Iron Oxides (natural pigment). I currently use Clinique’s City Block Sheer SPF 25 and was wondering if I should switch to the aforementioned one. Thanks! Bottom line… what is your favorite brand for the face and the body? I can’t say that I have one. There are lots of choices out there, at least on a theoretical basis. I certainly haven’t tried all of them. What do you think about this sunscreen? does it provide reliable UVA-UVB protection?Unffortunatly ,here in Europe companies that produce sunscreens are not obligated to declare the amount of each active ingredient.i just hope you find this good most cause it has tinosorb s .
Ingredients: AVENE THERMAL SPRING WATER (AVENE AQUA), OCTOCRYLENE, C12-15 ALKYL BENZOATE, BUTYLENE GLYCOL, DIMETHICONE, DIISOPROPYL ADIPATE, METHYLENE BIS-BENZOTRIAZOLYL TETRAMETHYBUTYLPHENOL, CYCLOMETHICONE, WATER (AQUA), TITANIUM DIOXIDE, BUTYL METHOXY-DIBENZOYL-METHANE, BIS-ETHYLHEXYLOXYPHENOL METHOXYPHENYLTRIAZINE, GLYCERYL STEARATE, PEG-100 STEARATE, POTASSIUM CETYL PHOSPHATE, PVP/EICOSENE COPOLYMER, CAPRYLIC/CAPRIC TRIGLYCERIDE, CAPRYLYL GLYCOL, CUCURBITA PEPO (PUMPKIN) SEED OIL (CUCURBITA PEPO SEED OIL), DECYL GLUCOSIDE, DIMETHICONOL, DISODIUM EDTA, FRAGRANCE (PARFUM), GLYCERYL BEHENATE, GLYCERYL DIBEHENATE, HYDROXYETHYL ACRYLATE/SODIUM ACRYLOYLDIMETHYL TAURATE COPOLYMER, ISOHEXADECANE, POLYSORBATE 60, PROPYLENE GLYCOL, SILICA, SORBIC ACID, SORBITAN ISOSTEARATE, STEARYL ALCOHOL, TOCOPHERYL GLUCOSIDE, TRIBEHENIN, XANTHAN GUM. While I can’t be 100% sure due to the lack of %s, this sunscreen most likely provides excellent UVA and UVB protection based purely on the presence of octocrylene-stabilized avobenzone, which is then shielded and amplified by both Tinosorb S and M–all of which are present in relatively high concentrations. So yes, this is likely pretty fantastic! Hi Ella. Mind sharing the name of this sunscreen please? Is Avobenzone the only chemical that absorbs the whole UVA spectrum from 310-400 nm? How about nano zinc oxide? Thanks so much for all your informative posts! Well, nano-sized zinc oxide and titanium dioxide both protect (to different degrees) against the entire UVA spectrum. Avobenzone, even when stabilized with 10% octocrylene stops giving meaningful protection after about 390 nm; at 400 nm it basically provides no protection. All three UVA ingredients have different UV spectral and efficiency profiles. Also, keep in mind that just because these compounds for the most part, cover the entire UVA spectrum, doesn’t mean that if a product contains these ingredients, you’ll be getting FULL protection from all UVA rays. Sunscreens protect against UVA rays just like UVB rays: by a certain percentage. The idea that you either get complete UVA protection or none at all, is completely untrue. Yes, it makes sense. It would be great if you write an article on the pros and cons of Mexoryl, Tinosorb, and Helioplex. Thanks for your response! I’ll actually be doing all that in my Sun Protection Page, which will include all things relevant to sunscreen use. 🙂 Stay tuned because I’ll be posting the publishing schedule soon! Could that high SPF be attributed to the vehicle only? Would that be a bad thing? Like I stated in the post, proprietary vehicles can certainly influence the final SPF value, which certainly seems like the case with this product. However, also note that bisabolol is a potent anti-inflammatory derived from chamomile. So that will play a role in reducing erythema. Furthermore, BHT can do the same thing (http://www.ncbi.nlm.nih.gov/pubmed/1881965), though likely to a smaller degree due to the vey low concentration. It acts similarly to vitamin E in terms of antioxidant potential. I’m not saying these two ingredients are solely responsible for the heightened SPF value. But they definitely play a role in it. I wouldn’t recommend this product regardless, because even if the SPF value is actually very high, and can be attributed to the UV filters, the amount of protection against UVA rays is completely unknown. Hm, I really thought the bisabolol was present at unimportant amounts! And yes, I wouldn’t use that sunscreen as well, I was just curious about the high SPF. Thanks again, John, for further instructing me on the very complex world of sunscreen formulations. I can’t wait for your post on the Basf simulator, because I often feel confused about it (especially when a sunscreen with 5% zinc has better graphs at the end of the UVA-I range than another with 10% zinc and the whole UVA-PF in vivo/in vitro and “re-calculated”). Very confusing. That could still be true. I’m not saying the bisabolol and BHT are completely responsible. But they do contribute to the final SPF. Also, what sunscreens were you referring to specifically with the whole 5%/10% ZnO thing? Because that’s impossible, unless there are other filters that protect against UVA-I rays present. Maybe my premise is wrong, but I though that titanium dioxide didn’t offer UVA-I protection, especially at the end of the UVA range (380-400nm), but when I look at that range in the graphs for a sunscreen with 10% zinc oxide and another with 5% zinc oxide and 5% titanium dioxide, the later does better. No, TiO2 does provide UVA-I protection. It’s just that at the concentrations (<10%) used in most products, it doesn't provide "enough" overall UVA-I protection (340 nm to 400 nm). Because ZnO has a more stable UV spectral profile and is more likely used in higher concentrations, it is deemed a better provider of UVA-I protection. •TiO2 provides similar protection from about 380-400 nm as ZnO. Also, this should also help you make more sense why ZnO is considered “better” than TiO2: UVA-I rays should not be treated equally. Because all UVA-I all basically penetrate into the entire dermis, the only difference between shorter and longer UVA-I rays is that the shorter ones are better at generating free radicals because they are more potent. Therefore, it’s a little more important to block the shorter ones than the longer ones. On the other hand however, longer the UVA-I rays are present in normal sunlight at a higher amount than shorter ones. So it can sort of balance things out depending on where you are in terms of altitude, latitude, and exact (and rather complicated) calculations. Because a lot of this is unknown and/or will vary from person to person, when I make general recommendations, I tend to recommend products that contain both ZnO and TiO2, with more ZNO than TiO2. Of course there are exceptions, like with the EltaMD SPF 46 (9% ZnO, 7.5% octinoxate). But I make those product recommendations because they are so cosmetically pleasing, which will encourage people to apply more of it, which is very important. Consider checking out the latest comments between another reader (Emy Shin) and myself on this post: http://www.futurederm.com/2013/04/26/how-much-exactly-is-2-0-mgcm2-the-amount-of-sunscreen-necessary-to-achieve-the-labeled-spf-rating/ Perhaps that’ll reveal why I recommend sunscreens that don’t necessarily provide a lot of sun protection. But yeah, if a product actually contains about 15%+ of pure TiO2, I’d recommend it on a theoretical level. However, given the high refractive index of TiO2, I’d imagine that product to be very white, heavy, and just not very cosmetically pleasing. However, that is something each individual has to check out in-person and decide for himself. For example, this (http://shop.nordstrom.com/s/jane-iredale-glow-time-full-coverage-mineral-bb-cream-broad-spectrum-spf-25/3355579) contains 20% TiO2 and has a tint to it. This would provide enough overall protection, but I have no idea about any of the other characteristics. Yes, it does. Thanks, John! Hi John, I hope I’m not “late to the party” and missed if you covered this, but it sounds like coated ZnO is the way to go. I’m simply looking for a high UVA protection and often use Shiseido Ultimate Sun Protection Lotion 50+ with 19.3% zinc oxide, thinking that was great but now I don’t know if it’s coated or not. How do you know if your ZnO is coated or not? When I select inorganic products I primarily just look at the %. Does that mean that the Shiseido could never really block above a 10 spf? I know there are other ingredients that help block but I’m wanting the aging, UVA’s blocked primarily!!. I did use the Devita for awhile and thought, “this has to be too good to be true” because it was way too cosmetically elegant to feel like it was working! Thanks for all you do! Yeah, I’ll be sure to explain this issue in detail when I publish the post of how to use and interpret the BASF sunscreen simulator. But I’ll briefly explain it to you now. 🙂 TiO2 and ZnO are almost always coated to reduce reactivity, more so with TiO2 than ZnO. Unless explicitly stated or indirectly deduced from the vehicle, consider all inorganic UV filters to be coated. As for the Shiseido product, don’t forget that there are lots of organic UV filters (7.4% octinoxate and 3% octocrylene) to boost SPF, not to mention 1.7% TiO2! That’s probably one of the best sunscreens you’ll find if you’re in the US in terms of BOTH UVA and UVB protection, since we don’t have access to the Tinosorbs (bad FDA haha). I tried the Paula’S Choice Hand cream SPF 30 but didnt actually like it so now i am trying to find alternatives. On the beautypedia.com, the kiss my face spray has been marked with BEST but after reading your post i don’t know what to believe. There’s this notion that Paula likes to proliferate, which is that you either get reliable UVA protection or none at all. That’s definitely not the case. Sunscreens block UVA rays just like they do for UVB rays: by a certain percentage. You are absolutely correct that 2.2% is not enough! And like I stated in the article, I’ll be sure to write a post on how to use and interpret the BASF sunscreen simulator. Wow, quite an eye opening post. I always thought that at least 5% zinc oxide was sufficient for sun protection. Does this mean though that even sunscreens like Paula’s Choice RESIST hand cream spf 30 doesn’t provide enough SPF? On the website it claims to have SPF 30 with 6% zinc oxide and 2.32% titanium dioxide but when i entered it into the BASF simulator, it gave a miserable spf 8 rating? When a product is tested, the actual formulation that’s to be sold is used as the test. Therefore, because that product contains quite a few antioxidants and anti-inflammatories, they will exaggerate the true SPF rating. I definitely don’t think it provides enough protection when used on a regular basis. I mean, Paula thinks that like 2-3% of TiO2 or ZnO will ensure UVA protection. THAT IS IMPOSSIBLE. Sunscreens block UVA rays just like UVB rays, that’s why there’s a UVA-PF/PPD and an SPF. There’s this idea that you either block all UVA rays, or none at all. Unfortunately, that’s not the case. Thanks for the clarification John. Have another question though if you don’t mind: what is your opinion on Mexoryl XL/SX sunscreen filters? I’ve noticed that you’ve never mentioned them before (probably cause it’s not available in the US) but I heard that it’s one of the most stable and efficient sunscreen ingredients around. Probably better than Tinosorb? One sunscreen that uses this is Kiehls Ultra Light Daily UV Defense SPF 50. I tried entering the ingredients into the BASF simulator but am having difficulty cause I can’t estimate the percentages of the sunscreen filters. Can I get your opinion on this sunscreen please? As far as organic UV filters go, the two Mexoryls are very good because they are quite photostable and efficient; I like Mexoryl SX more than XL since it provides more UVA protection overall. I don’t mention then much because yes, they are hardly available in the US. I’d still say that the Tinosorbs are a bit more efficient than the Mexoryls, but they are both very good and a welcome addition to any sunscreen. As for the Kiehl’s product, because the %s aren’t listed, I can’t give you a definite answer. But it likely provides very good levels of UVA and UVB protection based on the placement of the UV filters on the ingredients list and their respective UV spectral profiles. Still, it’d be nice to know for sure. Sigh. Interesting article! I learned so much I didn’t know. Questions though – the Devita site you referenced says “Test studies show that our ZnO can be used to create formulations of greater than 30 SPF and PA greater than 10.” And drbaileyskincare.com states “It takes 17% zinc oxide to get an SPF 30 sunscreen without chemicals.” Neither site references where their stats come from though. So, any idea why these sites are saying different from the abstract you referenced (max 10 SPF for ZnO)? And what is does PA stand for (in the Devita quote)? But that’s the thing. There’s nothing special about “their” ZnO. They’re just non-coated, non-nanosized (around 240 nm) particles in a simple vehicle, as demonstrated. And it’s not like Devita manufactures their own ZnO particles. They buy it from some manufacture like BASF, who likely supplies hundreds of sunscreen brands. As far as I know, it is impossible for ZnO to achieve such a high SPF rating unless it is used in ridiculous high concentrations like 50%, which isn’t even allowed in most countries. As for PA, they’re referring to how much UVA protection is provided, since SPF only evaluates UVB rays. However, PA is not the actual correct term. PA comes from the Japanese system of rating levels of UVA protection. There are four levels: PA+, PA++, PA+++, and PA++++. But there’s no such thing as PA >10. The correct term would be to use UVA-PF or PPD. I mean, if they can’t even use the correct term… how can you trust their claims. It all boils down to whether or not you want to believe Devita–someone who has a strong commercial motive to bend the truth, or the information that I have presented here with peer-reviewed (mostly unbiased) scientific documentation. As for Dr. Bailey, I really like her blog) But that doesn’t mean that she’s always correct. For example, another reader told me that she stated the 5% ZnO alone provides enough UVA and UVB protection. What?! That will definitely provide insufficient levels of sun protection. I have no idea why she would make those claims, but they don’t match up with the data presented here. This was an eye-opening post indeed! The Devita sunscreen that you used as example has been my go-to sunscreen for more than a year now so it was a bit dissappointing to see the analysis….looks like I’ll have to find a more high SPF reliable sunscreen now. It’s really mind blowing. I’m glad you brought this to everyone’s attention. I’ve personally used the basf simulator and it’s a very useful tool. However, it never gives me good SPF ratings with 7.5% octinoxate. Shouldn’t that amount provide high SPF protection? Nice! Well alone at the maximally allowed concentration, it won’t provide super high ratings. But the same can be said about all the other organic UV filters allowed in the US. In fact, you’ll see even lower SPF ratings with those.. Octinoxate is the generally considered the most potent, though I admit it’s not very stable. But in combination with other UV filters that stabilize/shield it, it can help achieve a high SPF rating. Hm, I see. So, for instance, in combination with zinc oxide it can provide a balanced sunscreen? I ask because a lot of in part physical sunscreens with zinc also use octinoxate. Well, it depends on what you mean by “balanced” lol. ZnO has the most stable UV spectral profile, meaning that it protects against UVA and UVB rays almost equally well (uncoated ZnO has a more stable, but weaker profile than coated ZnO). Adding octinoxate would only boost UVB and some UVAII protection. So overall, it would actually UN-balance the sunscreen’s spectral profile. However, that’s just speaking in relative terms. The most important thing to note, is that adding octinoxate to ZnO would boost the overall SPF rating up to sufficient levels–something that ZnO naturally cannot provide alone, unless at very high concentrations. ZnO of course, would retain its ability to protect against UVA rays. Yes, it does! Thanks for clearing that out for me. Have you found a truly balanced sunscreen? Actually, that’s almost impossible because even the strongest sunscreens available in the US can’t provide UVA-PF values greater than 13 at 2.0 mg/cm^2. So the strongest sunscreen that’s truly balanced would have a UVA-PF of 13 and an SPF of 13. Obviously, that’s not very desirable. Just for fun, I ran some simulations, and it’s incredible how efficient the tinosorb filters are. With just 5% of each you get a great sunscreen. Also, when you add 5% tinosorb m to 10% zinc oxide and 5% titanium dioxide you get a pretty awesome sunscreen! Looking at the graphs, it’s really remarkable. But i guess that would be a pretty whitening sunscreen. I haven’t encountered many interesting formulas with tinosorb m, basically because they always seems to have avobenzone and other organic filters and never zinc oxide, probably because it isn’t approved as a sunscreen filter in Europe. Agreed! Me <<<< super jellybean. 😉 The FDA needs to move their rear ends! Thanks for this post, that was really eye-opening! Teehee. Glad to hear that you learned something, too! First off, very interesting and informative article! I know you stated that you’re going to do a post about the BASF sunscreen simulator, but I already had to go check it out and I noticed that for both ZnO and TiO2, you have to select oil phase or water phase. I’m not sure what those mean and how would I know which is being used in a particular sunscreen? Thanks! Thanks for reading! Well if the inorganic UV filters are coated, which is usually the case with ZnO and almost always the case with TiO2, they will be in the oil phase. The rare times that ZnO is uncoated, it will be in the water phase. *Mindblown* … Super post ! Now I have a question … In India drugstore brands donot mention concentrations of active ingredients ! So is there a maximum.SPF that they can attribute to presence of these antioxidants antiinflammatories ? Like my sunscreen labelled SPF 90 has soy and aloevera listed after Zinc oxide, and a cocktail of other chemical ingredients ! Is there something to approximately predict amount of protection.i am getting ! Yay thanks! Well SPF 90 is ridiculously high, so it’s highly likely that the antioxidants and anti-inflammatories do contribute to the final SPF rating. However, without % of the UV filters listed, there’s no easy way to find out how much sun protection they UV filters alone actually provide. However, if you’d like to list the full ingredients for me, I’d be happy to give you my assessment.